Refined sugar is made from sucrose extracted from raw sugar cane or sugar beets. Often added to processed foods and beverages, refined sugar has several forms such as granulated white sugar, brown sugar, fructose, sucrose, dextrose, high fructose corn syrup and malt syrup. The average American consumes about 22 tsp. of refined sugars each day, which is 355 calories, according to the American Heart Association, or AHA. The recommended daily consumption of added sugar is 150 calories or 9 tsp. daily for men, and 100 calories or 6 tsp. for women. Consuming excessive amounts of added sugars may cause serious problems with your health. An obesity epidemic has developed in America over the past 30 years, with over-consumption of refined sugars greatly contributing to the dilemma, according to the AHA. Sugary foods contain a lot of calories in a small amount of food, which may cause you to overload on calories before your stomach feels full. Refined sugar is composed of simple carbohydrates, which are converted into glucose for energy. Any unused glucose is stored as fat cells in your body. When the normal bacteria inside your mouth come into contact with sugar, acid is produced, which destroys tooth enamel and eventually results in tooth decay, according to the American Dental Association. Dentists recommend that their patients limit consumption of sugar-filled sodas, cookies, doughnuts, and other snacks that may damage their teeth. 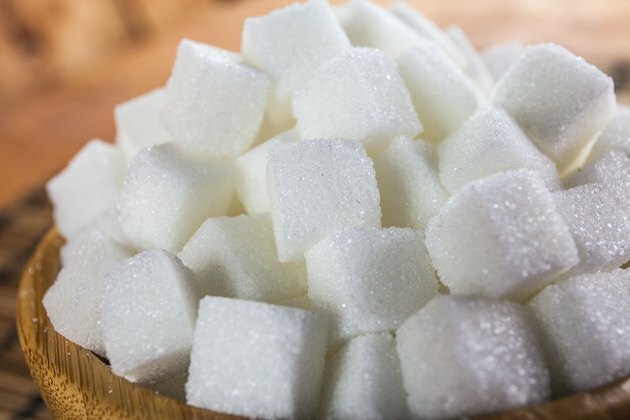 Refined sugars use your body’s stored B-vitamins, calcium and magnesium for their digestion. Natural sugars are present in foods such as whole grains, vegetables and fruits, which already contain the needed nutrients for their digestion. Regular consumption of foods high in refined sugar will deplete B-vitamins, calcium and magnesium stores from your body, writes Tessler. When your body lacks B-vitamins, your nervous system suffers and you may experience fatigue, depression, anxiety and lack of energy. Lack of calcium and magnesium may contribute to arthritis and osteoporosis, adds Tessler. Natural sugars are present in foods such as fruits, vegetables, whole grains and starches. Get the energy your body needs from these kinds of foods, rather than processed foods loaded with refined sugars. The AHA suggests cutting back on refined sugars in your diet by using less table sugar as a sweetener, reducing the amount of sugar in home-baked goods, and choosing all-natural fruit juices or sugar-free beverages. Consult your physician before making any dietary changes.